You are allowed to bring in any and all the food and drink you desire. But what should you bring? This depends upon what day you are going and where you are parking. If parking inside the track, you can take whatever will fit in your car or truck (RV's not allowed inside). You can always return to the vehicle to drop off or pick up stuff. If you park outside the track, you cannot leave to get to your car and then come back in. Also, its doubtful that you will be making return trips to your car on RACE DAY, even if you are parked inside the track. There is plenty of food available that you can buy at the track and prices are reasonable - hot dogs are $3, Shishkabob are $6, Funnel cake is $5. If you walk around and check out the various stands scattered about, you'll find a large variety of tasty food to choose from, such as Bar-b-que, Turkey legs, Polish Sausage, etc. A bucket of fried chicken is a popular choice. You can even bring a grill and have a cook out in the infield. I've seen people cook an entire lamb, then hand out free meals to whoever happened by! You'll usually find folks at the track are very generous. (But you may not find them very generous when fighting for a parking space!) All of the Indianapolis grocery stores will have box lunches available during racing season too. The speedway is currently offering a box lunch pre-order that you can make when ordering your tickets. Beer and soda are available at the track. DO NOT BRING GLASS BOTTLES!!! Lots of people bring coolers. I'm sure you'll see some guys with a cooler or two the size of a refrigerator, hauling it around on a wagon; or pickup trucks with a keg in the bed. You cannot buy take-out liquor or beer in Indiana on Sunday. The track has a special permit that lets them sell beer on Sunday, but they must first wait until noon. On race day, if you have a seat, there is a limit on cooler size - 14" x14". You can fit at least a 12-pack of beer into a cooler that size. You can save alot of time by hitting the consession stands when the race is going on. Right before the race and during caution periods, the lines for the concession line are long. If you think you'll be doing lots of walking around, you might consider buying food and drink at the track. There are refreshment stands everywhere. Then you'll be able to carry your other stuff (camera, souvenirs, stopwatch, suntan lotion, etc.) easier. I always recommend traveling as light as you can. On long practice and qualifying days, it is nice to be able to park inside the infield so that you can stop at your car occasionally and restock your supplies or drop off souvenirs. Once you are in the Speedway, you cannot get a pass to go out and come back in. If grilling out, you may need a tarp for protection from rain. Click to go view Race Party Ideas. 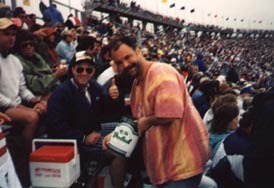 Copyright © 1996-2005 IndySpeedway All Rights Reserved. Created Dec. 26 1996.